Really good steak, service was great. The mix crostini are delicious, especially the truffles crostini. At the end of the meal they gave us cookies as a surprise gift. I had a lot of expectations before visiting your restaurant.The quality of the meat is good, but some people are disappointed because they can't eat it with oil and bone instead of meat. I don't know if the Italians like that kind of oil, but I was very disappointed in the quality of the meat. Steak and pasta was good, but house wine and bread was not. And seats were too narrow and complicated. Tralloria dall'osta, nv fail to disappoint. 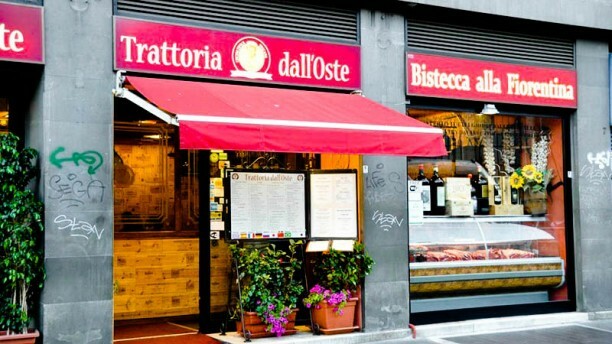 They serve the best Florentine steak in Florence. There are queues at the door every night, was lucky we made reservation ahead of the meal to avoid the long wait. The beef fillet is very good! The food was really delicious, tried pasta and the Waygu 2 lb (1kg) steak. The steak is amazing, service is good! must come again. Moderate steak and awful pasta. Id rather not recommend to my acquaintances. Invest your money to rather productive usage. The atmosphere, taste and service was excellent. Especially the staff, Giorgio who took care of us was wonderful. Oh I like it it so delicious. KUKA Very kind and handsome. He speak korean very well. Thank you! I want to visit again!